Cable Protector Compact 770X435X40mm Black 309484 Pack of 1 Ramp for cable protection system. Durable Black polyurethane construction with an anti-slip ribbed surface. 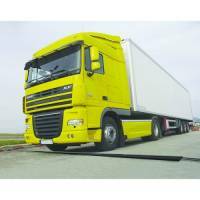 Cable supports provides support for the weight of crossing vehicles. Non returnable. 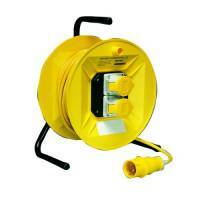 Extension Cable Semi-Enclosed Reel 20 Metre 13Amp 4-Socket 377109 Pack of 1 20 metre semi-enclosed cable reel. 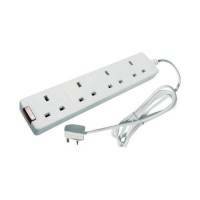 4 sockets for use indoors or outdoors. Comfortable handle makes it easy to wind in and out. Cable is fully protected for transit and storage13 amps/240 volts of power. Non returnable. Extension Cable Open Drum Reel 50 Metre 13Amp 3 Socket 349792 Pack of 1 50 metre semi-enclosed cable reel. 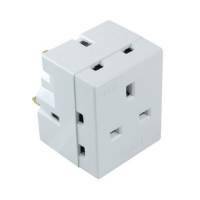 3 sockets for use indoors or outdoors. Comfortable handle makes it easy to wind in and out. Cable is fully protected for transit and storage13 amps/240 volts of power. Non returnable. VFM Yellow 14 Metre 16 Amp Cable Extension Lead 349793 Pack of 1 "14 metre extension cable. 16 amp, 110 volt yellow cable. Fitted with hardened plastic plugs and socket. Durable and protected when being dragged and dropped. Ideal for power tools in busy industrial or labour sites. Non returnable." 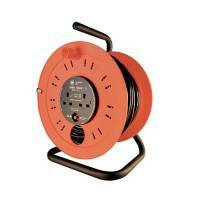 Extension Cable 25 Metre 16Amp 110V 2-Socket 1.5mm 349794 Pack of 1 25 metre semi-enclosed cable reel. 2 sockets for use indoors or outdoors. Comfortable handle makes it easy to wind in and out. Cable is fully protected for transit and storage16 amps/110 volts of power. Non returnable. Industrial Cable Protector Type A 4.5 Metre 360729 Pack of 1 "Designed to resist the harsh environmental conditions of outdoor use. Protect dangerous heavy duty cables from damage on construction sites, oil rigs and in warehouses. Type A. Hole Dia.14mm. Length 4.5m. Non returnable." VFM Black Defender Compact Cable Protector 370324 Pack of 1 Durable black polyurethane construction with an anti-slip ribbed surface. Cable supports moulded into the bottom of each section provides support for the weight of crossing vehicles. 30mm wide and up to 30mm high. Non returnable. VFM Metallic Silver Equipment Locker Floor Frame 315885 Pack of 1 Floor frame for equipment locker - SBY07882. 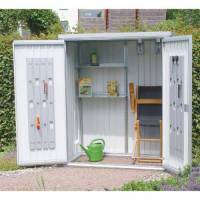 Provides stability if locker is erected without a foundation on uneven ground. Non returnable. VFM Metallic Silver Garden Shed Floor Frame 332971 Pack of 1 Floor frame for the Premier Shed - SBY18595. 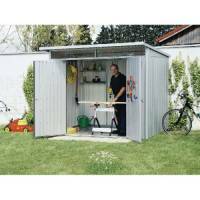 Provides stability if the shed is erected without a foundation on uneven ground. Non returnable. Metallic Garden Shed Floor Panels Pack of 1 Floor panels for the Premier shed (SBY18595). Made from aluminium chequered plate (floor frame required). Non returnable. 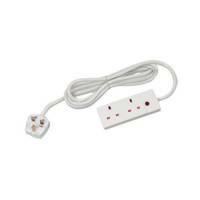 CED 2-Way Extension Lead White CEDTS2213M Pack of 1 "2 gang extension lead. 13 amp extension lead with 2 sockets, 2 metre cable and neon on/off indicator light." 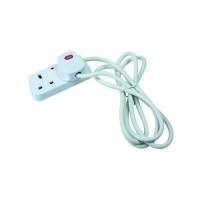 CED 3-Way Adaptor Fused 13amp White WAP3W Pack of 1 Multiple adaptor for plug sockets. Turn a single socket into three. 13 amp fuse for extra protection. Compact cube shape. Easy-grip design. 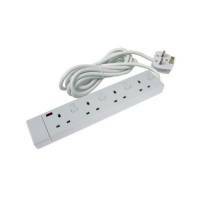 CED 6-Gang Extension Lead White 2m CEDTS6213M Pack of 1 Extension leads helping you to make the most from plugs. Provides you with 6 plugs. A clear neon light shows when the plug is on. 13 amp fuse protects against power surges. 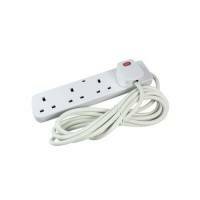 2 metre extension lead is perfect for hard to reach plugs..
CED 4-Way Extension Lead 13amp 5m White CEDTS4513F Pack of 1 4 way extension lead. Features four shuttered sockets. One switch. 13 amp fuse. Neon indicator and 5 metre cable. Suitable for domestic and office use. 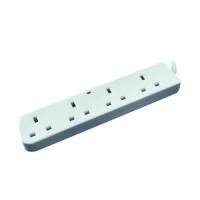 CED 4-Way Extension Lead White CEDTS4213IS Pack of 1 "4 gang extension lead with 13 amp fuse, neon on/off indicator light for lead and individual sockets and 2 metre cable." Heavy Duty 2-Way 13 Amp Extension Reel 25m Black WCR252/CHT2513 Pack of 1 "25 Metre Heavy Duty Extension Reel, with a sturdy metal stand. Two gang 13 amp, 240 volt, cable size: 3 core 1.25mm." 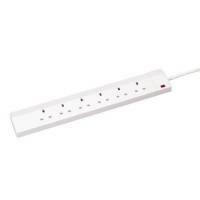 2-Way 13 Amp 5m Extension Lead White With Neon Light CEDTS2513M Pack of 1 Power strip with extension cord. Power LED indicator. 2 sockets for plugs. With 5m extension cable. Protective 13 amp fuse..
3M Command Medium Picture Hanging Strips (Pack of 4) 17201-4PK Pack of 1 "3M Command Strips. Easy to put up - no need for nails or screws. Holds on strongly. Easy to remove - innovative stretch release technology. Leaves no surface damage! Includes 1 pack, with 4 strips." 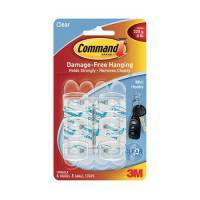 3M Command Large Picture Hanging Strips (Pack of 4) 17206 Pack of 1 "3M Command Strips. Easy to put up - no need for nails or screws. Holds on strongly. Easy to remove - innovative stretch release technology. Leaves no surface damage! Includes 1 pack, with 4 strips." 3M Command Mini Clear Hooks With Clear Strips 17006CLR Pack of 1 "3M Command Mini Clear Hooks with Clear Strips 17006CLR. Mini hook for hanging keys, coats, accessories etc. Holds 225g. Includes 6 hooks and 8 small strips." 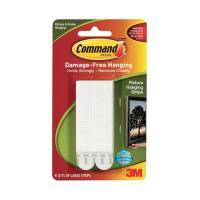 3M Command Jumbo Hook With Command Strips 17004 Pack of 1 Jumbo Hook with 3M Command Strips. 1 hook and 4 adhesive strips. Holds on strongly. Easy to put up - no need for nails or screws. Easy to remove - innovative stretch release technology leaves no surface damage. Holds up to 3kg.